The basis for this recipe came from another blog and we had it for dinner the other night. It was delicious, and simple, which is how I like my recipes. I tossed in some fresh spinach but you could also add some sun-dried tomatoes if you like. Give it a try the next time you need an easy, one dish meal for dinner. Preheat oven to 375F. In a large bowl, toss the mushrooms with 2 tbsp olive oil and arrange on a baking sheet. Sprinkle with sea salt and pepper. Roast for 20-25 minutes or until golden brown. Set aside. In a large pot, heat the remaining 2 tbsp olive oil along with the butter over medium heat. Cook the diced chicken until done (4-5 minutes). Toss in the onions and saute for a few minutes until onions begin to turn translucent. Add the wine and whiskey and cook for 2 minutes, allowing to bubble and “flash” off the alcohol. Add the chicken stock and cook for 2-3 minutes, then stir in the cream and reduce the heat to low. Add mushrooms, spinach, salt and pepper and simmer until the sauce thickens. Toss in the cooked pasta, taste for seasoning. Serve with some shaved Parmesan and crusty baguette. 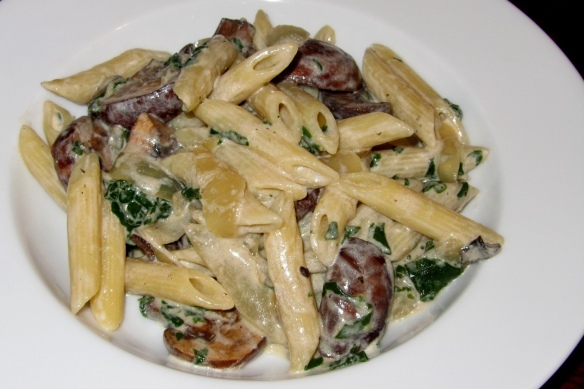 This entry was posted in Entree and tagged mostaciolli, mushrooms, one dish meal, penne, spinach, whiskey pasta, wine by quarlj01. Bookmark the permalink.